Dallas police officer Kimberly Howard wears a cross given to her earlier in the day by a random well-wisher outside department headquarters in Dallas on Saturday. Since the July 7 rampage, heartwarming scenes of support for the Dallas police have unfolded in front of the fortresslike Dallas police headquarters. In one on Sunday, an African-American woman threw her arms around a white police officer. She buried her face in his beefy shoulder as tears streamed down her cheeks. "So sorry that this happened," she said. "In Jesus' name bless him right now. Amen. I love you." The officer she was hugging is a communications sergeant, Stephen Toth, who wiped away his own tears. This is, after all, a force that has not gotten a lot of love in recent years. 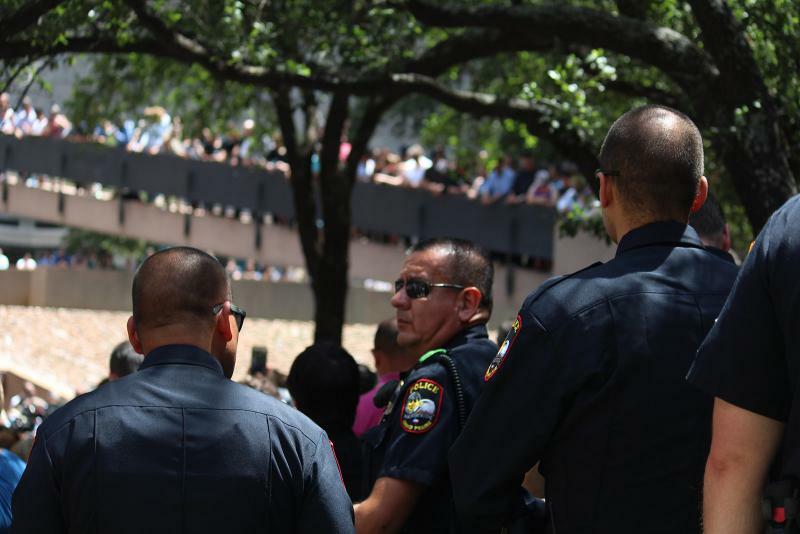 A survey last year by the Dallas Police Association showed that nearly 3 in 4 officers responded that morale is "low" or "lowest ever." "Pay is one issue, but it's even larger than even pay," Toth says. "I mean, who wants to come out and do this job, especially in light of seeing something like this?" By "this," he means the coldblooded murders of five officers. 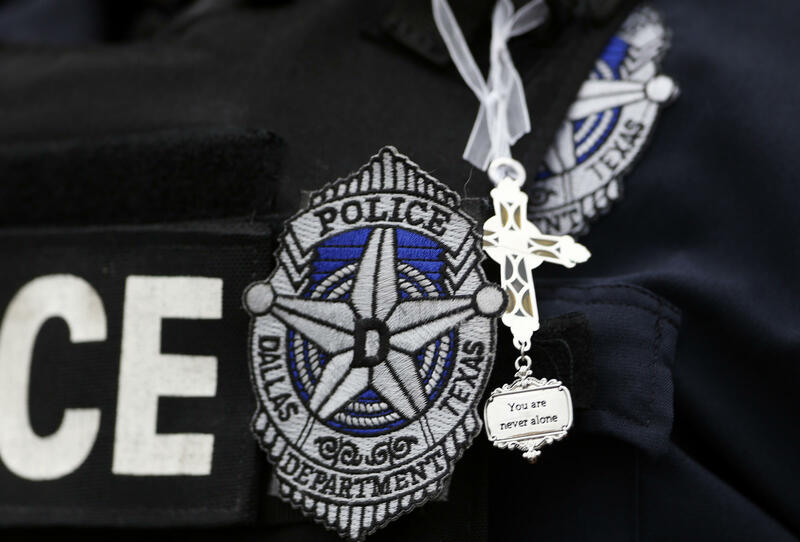 Dallas police are so underpaid that they routinely flee the force for smaller, neighboring departments or to cities such as Austin and Fort Worth, where starting pay at a lower rank is $10,000 to $15,000 better and health benefits are more generous. The Dallas department — with about 3,500 sworn personnel — is currently short at least 200 officers. "We're the lowest-paid department in the Metroplex. We're losing officers to suburbs at a tremendous rate," says Det. Ron Pinkston, president of the Dallas Police Association. Dallas' elected leaders say they can't pay the cops more because of a looming police payroll lawsuit, a nearly broke pension fund and competing needs such as crumbling streets. Fred Frazier, chairman of the Assist the Officer Foundation, says by his count, 94 officers have left DPD since October. "I hate to see our profession in decline. We can't even get guys to come for recruiting. We've had to cancel the last two [police cadet academy] classes cause there's not enough guys who want to be police officers," Frazier says. To be fair, this is not just a Dallas problem. Departments all over the country are losing young officers because of pay, workload and the recent challenges of policing in the glare of social media. But even before last Thursday's attack, Dallas had an unusually turbulent department, in part because of its chief, David Brown, 55. Only three months ago, all four police associations in the city were bitterly complaining about Brown's dictatorial, mercurial management style; the Black Police Association went so far as to call for his resignation. Yet today, Brown is earning universal accolades. "This is one of David Brown's finest hours," says James Ragland, a longtime Dallas Morning News metro columnist. "For him to step up in a moment of crisis and take full control and calm the city down, it's remarkable." It remains to be seen whether Brown will be able to use his restored reputation to stabilize the ranks and calm his detractors — and whether the Dallas police, overall, will be able to leverage their newfound appreciation to get city government to give them a decent pay raise. The calculated killing of five uniformed officers would be traumatic for any police department. It's especially difficult in Dallas, where the police force already suffered from low pay and low morale. Now, citizens are rallying around their officers in blue, but that raises a question of whether much will change. NPR's John Burnett reports. JOHN BURNETT, BYLINE: All day long in front of the fortress-like Dallas police headquarters, there are heartwarming scenes like this. UNIDENTIFIED WOMAN: I'm so sorry that this happened. BURNETT: An African-American woman throws her arms around a crew-cutted white police officer sweating in his body armor. She buries her face in his beefy shoulder, and tears stream down her cheeks. UNIDENTIFIED WOMAN: In Jesus' name, bless him right now. Amen. I love you. STEPHEN TOTH: I love you, too. BURNETT: The cops she's hugging is a communication sergeant, Stephen Toth, who wipes away his own tears. This is, after all, a force that has not gotten a lot of love in recent years. A survey last year by the Dallas Police Association showed that 3 out of 4 officers responded that morale is low or lowest ever. Sergeant Stephen Toth. TOTH: Pay is one issue, but it's - it's even larger than even pay. I mean, who wants to come out and do this job, especially in light of seeing something like this? BURNETT: This meaning the cold-blooded murders of five officers. Dallas police are so underpaid that they routinely flee the force for smaller, neighboring departments, or to cities like Austin and Fort Worth, where starting pay at a lower rank is $10,000 to $15,000 better and health benefits are more generous. The Dallas department is currently short at least 200 officers. Detective Ron Pinkston is president of the Dallas Police Association. RON PINKSTON: We're the lowest-paid department in the metroplex. We're - we're losing officers to the suburbs at a tremendous rate. BURNETT: Dallas elected leaders say they can't pay the cops more because of a looming police payroll lawsuit, a nearly broke pension fund and competing needs, like crumbling streets. Fred Frazier is chair of the Assist the Officer Foundation. He says, by his count, 94 police have left DPD since last October. FRED FRAZIER: We can't even get guys to come for recruiting. We've had to cancel the last two classes because there's not enough people that want to - want to be police officers. BURNETT: To be fair, this is not just a Dallas problem. Departments all over the country are losing young officers because of pay, workload and the recent challenges of policing in the glare of social media. 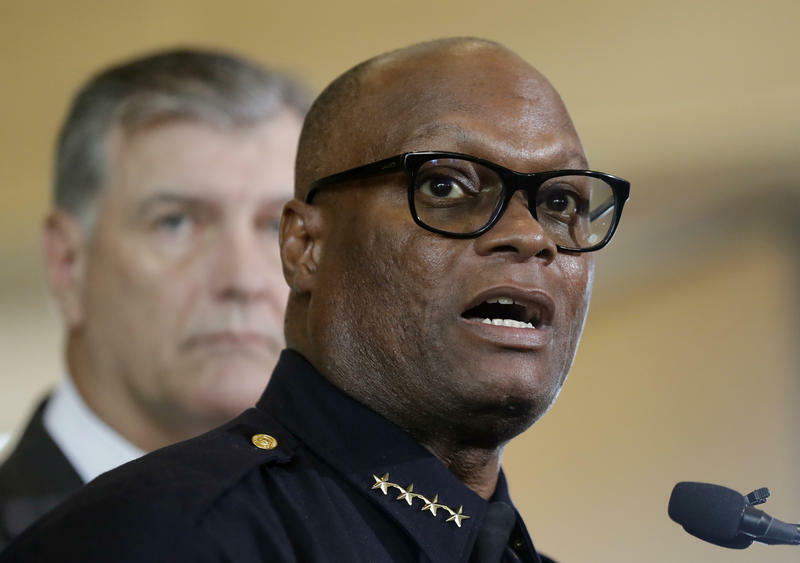 But even before last Thursday's sniper attack, Dallas had an unusually turbulent department, in part because of its chief, 55-year-old David Brown. The African-American police boss is unmistakable with his bald head and big, black glasses. And he's been on camera a lot lately. DAVID BROWN: This is my hometown. I'm a third-generation Dallasite. Big D, I want to say thank you to all of you for your show of support today. BURNETT: Only three months ago, all four police associations in the city were bitterly complaining about Brown's dictatorial, mercurial management style. The Black Police Association went so far as to call for his resignation. Yet today, David Brown is earning universal accolades. James Ragland is a longtime Dallas Morning News metro columnist. JAMES RAGLAND: This was one of David Brown's finest hours. For him to step up in a moment of crisis and take full control and calm the city down, it's remarkable. BURNETT: Will Chief Brown be able to use his restored reputation to stabilize the ranks and calm his detractors? And will the Dallas police overall be able to leverage its newfound appreciation to get city government to give it a decent pay raise? Some officers wonder whether this tragedy could be a turning point for their embattled department. John Burnett, NPR News, Dallas. Transcript provided by NPR, Copyright NPR. The parents of Dallas shooter Micah Johnson say they are surprised by his violent rampage and note he returned from an Army deployment to Afghanistan a changed man.